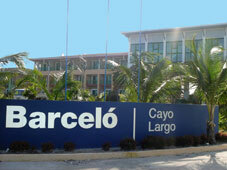 BARCELO CAYO LARGO HOTEL WILL CELEBRATE FOR FIRST TIME IN CAYO LARGO A WEDDING WITH ON LINE INTERNET COVERAGE. From 4: 00 pm on and for the first time in Cayo Largo, a wedding will be broadcast through internet, to allow all our clients, relatives and friends of the couple to see the celebration from their houses, working centers and anywhere in the world. The development of this wedding is organized, among other reasons, to promote this tourism market segment in Canada. 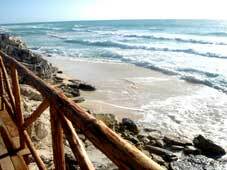 The link for having access to this coverage is http://barcelonews.cayolargodelsur.cu, clicking at Wedding banner. DICIEMBRE 28, 2008 Works on the new platform to have access to the beach are finished while the sand comes back to the beach in front of the hotel, little by little. 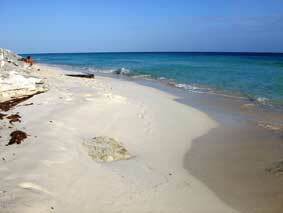 Nature is wise and the same way it took the sand of our beach away, now is giving it back. That�s why we can say Barcel� Hotel beach is coming back today. �It is a slow recovering process helped by the influence of cold fronts, as you can see, it is a very fragile procedure which could has some instability till the movement of sand finishes�, said Jorge Felix Gutierrez, sub director of the Hotel. The direct access to the beach it is not available yet, it will be done when a much better recovery of the sand strip will be shown. Meanwhile the reconstruction of the platforms which gives the access to the sea was finished with a spectacular design which will allow a greater capacity of clients and the development of different and exclusive activities for our clients. Enjoying the kindness of our tourist destination, Lily and Normand, Distinguished Guests of Cayo Largo and owners of the so visited Canadian site and administrators of its forum arrived yesterday. 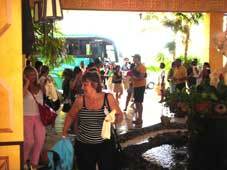 These customers that after the crossing of the hurricane Michelle over Cayo Largo played an important role in the promotion of the tourist product through their site and have also repeated for 16 times in the Cayo , manage the forum which has more than enough visits to Cayo Largo in the internet with Hundreds of daily accesses. Lily and Normand are lodged in Villa Lindamar, village belonging to the Isla del Sur and Complex of Villas Hotel and all will travel to different places of Cayo Largo to visit all their friends. The picture was taken during their visit to Barcel� Cayo Largo Hotel, where they received a special invitation to participate next Sunday in the dinner offered by the Hotel to its repeat customers. 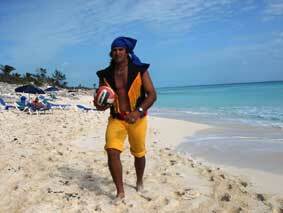 TO THE INTERNET NEW WEB SITE DEDICATED TO REPEAT CUSTOMERS OF BARCELO CAYO LARGOHOTEL. Barcel� Cayo Largo Family, is the name that will take this web site which will get rich with the pictures sent by our clients every day or those they are taken during their stay in our tourist destination. Those clients that have been recognized with the Distinguished Guest condition, our repeat ones, the Miss and the Mr. Barcel�, every week selected in our Animation Show, will be known by this site, as well as to know the repeat ranking of our clients. 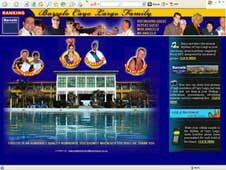 With this there are already three the online web sites of Barcel� Cayo Largo Hotel, one about general information of the hotel http://barcelo.cayolargodelsur.cu , another dedicated to news http://barcelonews.cayolargodelsur.cu and the last one rushed today. All of them with the objective of keeping informed our clients. 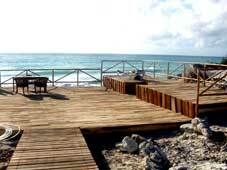 WHILE BARCELO-CAPRICHO BEACH GETS MORE BEAUTIFUL EVERY DAY, BARCELO HOTEL�S BEACH BEGINS TO RECOVER. 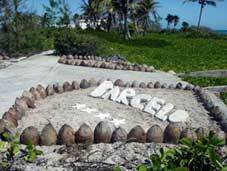 Barcel� -Capricho, the beach that has caused sensation in Cayo Largo, for its beauty and exclusive service for Hotel Barcel� customers, continues enlarging its sand range. What was said before is shown by these new pictures taken this afternoon. 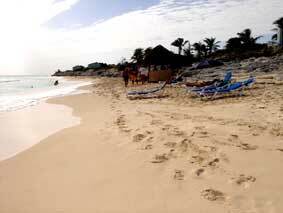 On the other hand, the recovery of the beach begins in a slow but continuous way in front of the Hotel, called Playa Blanca, beginning approximately at 150 meters to the last East Bungalow. 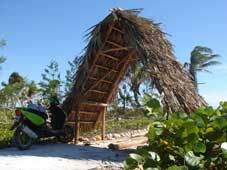 A PLATFORM AND GANGPLANK TO THE BEACH WITH A NEW AND ORIGINAL DESIGN BEING BUILT. 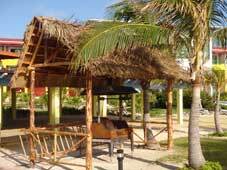 Barcel� Cayo Largo Hotel continues improving its tourist product and intensely works in the building of the access bridge to the beach and a new design for its platform is proposed. 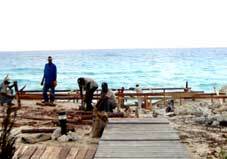 After having approved the new design proposals presented to the hotel for the reconstruction of the main platform that, besides giving access to the beach has become one of the most pleasant places to enjoy one of the most beautiful sunsets in the Caribbean, the construction works go to good rhythm. This time, the design includes the construction of two levels, what will allow, apart from enlarging its capacity, to establish new areas to guarantee more privacy and to be able to carry out dinners, romantic parties, among other exclusive activities. The works which began at the beginning of this week foreseen to finish December 23, Christmas� eve. On the other hand, the Hotel that has begun to rush to the market as weddings destination, is about to finish the construction of one of the most original Wedding Gazebos of the tourist destination, that will not only allow to guarantee this type of activities but also to offer exclusive romantic dinners to our clients. The Hotel also organizes its Christmas parties with a special program of activities, including the celebration of its fifth opening anniversary next December 26. 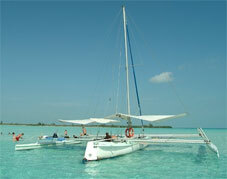 AN UNFORGETTABLE GIFT OF THE BARCELO CAYO LARGO HOTEL FOR ITS REGULAR CUSTOMERS. The night could not be more special, everything seemed to be among relatives, laughs, chats, good humor and a lot of love on everything about Cayo Largo, those beautiful moments marked the Special Dinner for regular customers prepared by the Barcel� Cayo Largo Hotel. El chosen place could not be more charming, the Ranch�n �Velamar�, which decorated for the occasion awaited them close to its workers and the Directors� staff of Barcel� Hotel, set by an excellent Cuban traditional music. 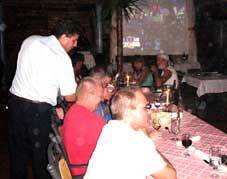 Then, the surprise of the night came, when everything seemed that it would began like a protocol meal, a great giant screen exposed a video with pictures taken to our regular customers during their stay in the hotel; many of them were surprised and could not hide the emotions, later on they enjoyed the dinner with a special menu for the occasion. 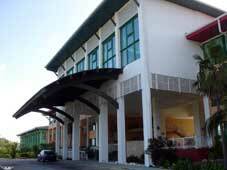 And, when everything seemed to get to the normality for our regular customers, a letter thanked them on behalf of all the workers of the hotel for having chosen again to be among us, accompanied by a CD with all the pictures to enrich all the experience and pleasant memories that will accompany them forever in their lives. 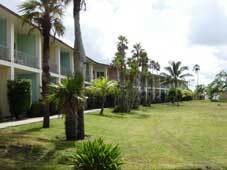 FIRST BOTANICAL GARDEN TO CAYO LARGO DEDICATED TO AUTOCHTHONOUS PLANTS IN THE INTERIOR OF A HOTEL. 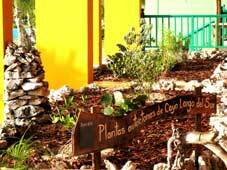 Barcel� Cayo Largo is immerse in the maintenance and preservation of the autochthonous flora of Cayo Largo del Sur, an idea for the improvement of its gardening without any necessity of introducing new species of plants to the Key. We �Not only do this with an ornamental intention, but, as part of our environmental politics, which allows us let our clients to know even more about the natural beauties of this tourist destination� commented to us the Hotel management. In the small garden, located in the central isle accessing to the �Olazul� Buffet Restaurant one can find autochthonous plants such as, �Palma Trina�, �Yana�, �Mangle Rojo�, �Hicaco�, �Guano de Costa�, among others. This exclusive garden won't have beautiful flowers, neither attractive bushes, but it will be full of love and zeal, to give our clients a piece of our true Cayo. 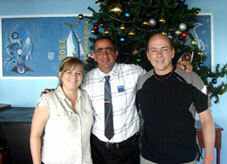 Jos�e Seney and Michel Lemaire, DECLARED DISTINGUISHED GUESTS OF CAYO LARGO DEL SUR. The tourist destination gets dressed for a party again while declaring two of our faithful clients like Distinguished Guest of our Tourist Pole. .
Jos�e Seney and Michel Lemaire are lodged in the Barcel� Cayo Largo Hotel and with this visit, they already add 24 times of coming to this Island of dreams. It was a very welcoming afternoon, accompanied by directives of the Gran Caribe Enterprise and those of the Hotel that welcomes them, certificates, gifts and the traditional pictures for the Museum House and the website were part of this activity. During the period of September and October, this place belonging to the Gran Caribe SA Hotel Group in administration contract with the Marlyn Marina has made an important group of works to increase the facilities standards as well as to remodel its fleet. With the entrance in operation of this craft, there are already two Pirogas, available; this ship stands out for its original design, what allows to take advantage to full capacity of the Caribbean sun, for its few draught it is the most ideal to carry out trips to the so much liked and exclusive for its beauty and virginity, Cayo Rico. 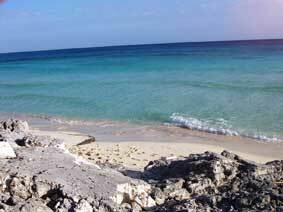 www.cayolargodelsur.cu REACHES TO 9 000 VISITOR, WITH 79 286 PAGES CONSULTED. The web site of the destination continues positioning, it demonstrates this way the significant increasing of visitor's levels at arriving at 8:45 a.m. this morning to 9 000 visits, passing from averaging 53 daily visits in the first days in the internet opening to 159 in November, what means an increase of 39% compared to the same period the previous month. 79 286 pages have been visited so far, what averages 8,80 pages for visitors, with 640 643 applications and 29,31 Giga Bytes of information has been trafficked, averaging in the last days more than 1 Gbyte of news discharges, 5 281 have been new visitors and the repeatance index is 169% . Up to the date 2 833 files have been discharged, of these, 1 345 of videos, 545 of music and 721 of high resolution pictures, among others, the visited pages have been those of news, the site dedicated to pictures and videos, as well as the web site dedicated to the exclusive Barcel� Cayo Largo Hotel. It has increased to 68,7% amount of visitors that have included the web site into favorites. 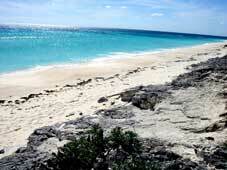 The main countries from where the site has been consulted still are United States, Canada, Argentina, which grows significantly, Brazil, Italy, among others, direct link has been located to the Cayo Largo site in 197 websites of different countries and the main searching motor from where it has been consulted is GOOGLE. 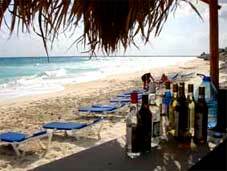 BARCELO CAYO LARGO MAKES �CAPRICHO� REBORN, AND ARRANGES ITS SPECTACULAR BEACH AS AN ALTERNATIVE FOR ITS CLIENTS. So as to its reopening next Friday November 21st, Barcel� Cayo Largo Hotel makes a legend reborn and turns �CAPRICHO� beach into an alternative for its clients. As it was said by Tomeu Pizz�, General Hotel Manager the devise is to offer the clients a place very near the hotel, where they�d be able to enjoy an exclusive beach, with the personalized service of his workers. Up to this beautiful place that is less than three minutes time from the Hotel, the clients will move in a continuous schedule transportation which will start to lateral of the west wing rooms of the building. Among the services the clients will be able to enjoy, there are offers of alcoholic and non alcoholic drinks including rapid food to the grill, beaches parasols, as well as different entertainment activities. It is not a dream; it is a reality, �CAPRICHO� reborns thanks to the workers and directives of Barcel� Cayo Largo Hotel�s will. BARCEL� CAYO LARGO REOPENS ITS DOORS NEXT NOVEMBER 21. 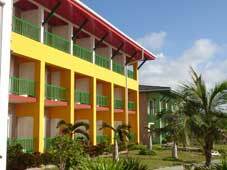 Barcel� Cayo Largo Hotel will receive its first clients again after its closing in August, next November 21. During the months of September and October, workers and building brigades coming from Havana and Varadero have carried out an important group of works, for the recovery after the crossing of the Hurricane Gustav, as well as to complete the improvements planned for that period. For this reopening hotel will show a renovated image, with very fresh colors, improvements in the service areas, to capital restoration of the climate system, investments for an effective operation of the water heater system, among other works lives. 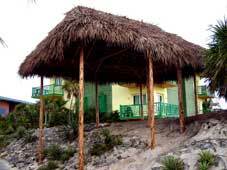 This hotel that has always been characterized by its excellent service and the personnel's quality, foresees an excellent winter season, with high occupation levels, its beach that was affected by the crossing of the hurricanes, recovers in to gradual and natural way, while this happens the hotel it will have a system of free transportation to the best beaches of Cayo Largo, Paradise and Siren, although the client will be also able to enjoy the exclusive Capricho beach by the west side of the Hotel. With the confirmation of the Italian clients' of travel agencies, SUBAQUEA - ADRIA EXPRESS, three groups will start in February 2009, it is a fact the beginning of this new tourist product. 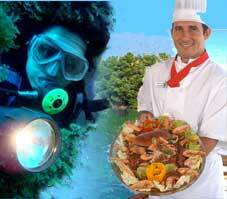 �La Ruta de los Sabores�, as its name says, it is a new product that combines the excellent immersions in one of the most beautiful diving areas of the world, with the typical Cuban cuisine. In a beautiful itinerary by ship, from the port �La Coloma� in Pinar del Rio province, till the marine of the Hotel Colony, after having enjoyed first a tour by old cars in the capital and later a horseback ride in �La Guabina�, the clients besides the diving in areas full with species marine, will visit the key San Felipe, where they will be able to share in a natural atmosphere with the Iguanas. In the Hotel Colony every afternoon the Chef will be waiting, where they will be learning as much in the theory as in the practice, the secrets of the good Cuban cuisine, its seasons and flavors. Demonstrating trust in our tourist destination, in October we had more than 6000 tourists that enjoyed the excellent kindness of the nature of this tourist pole. Being the highest number since 2004, when the pole reopened its facilities in the months of September and October. 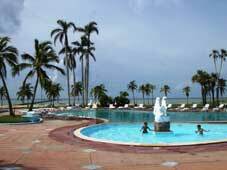 The prompt recovery of the hotel plant and its infrastructure after the hurricanes Gustav and Ike, allowed the turoperoperators and travel agencies continued betting for the service and attention that is given in this turist destination. THE COLONY, AN EMBLEMATIC HOTEL IN THE ISLE OF YOUTH BEGINS to REBORN. The Colony Hotel, belonging to the Gran Caribe Hotel Group, characterized to be in a privileged place from the natural point of view, which serves as base for Diving activities in the best area in immersions of Cuba and among the bests of the world, reopens its doors after having concluded the first work stage in the remodeling process taking place in this installation. The Image is completely different, it is just necessary to get closer to its main entrance to be able to visualize a Hotel with a renovated image, full of colors and flags, where the transformations can be sighted in all its areas. 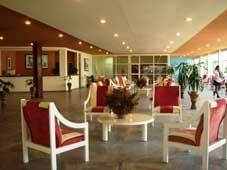 A Lobby which is a true gift of design and good taste to this Hotel, reaching its 50 years next December 31, a Pool from which apart from refreshing, one can enjoy one of the most beautiful Sunsets in all Cuba. Its rooms are being remodeled, including a change of furniture and equipment, works are carried out these moments in the termination of the Bar Sábalo, distinctive mark of this Hotel, as well as of the Snack Bar, among other works expecting to conclude in three stages, the second of which will culminate December 31, to celebrate its 50th birthday, and the third and last one on March 9 when the works in all the rooms will be completely concluded, and it will be recapturing after 10 years, the celebration of the Fotosub 2009 event. 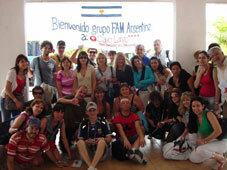 In the morning hours of October 21 in flight of Aerogaviota, coming from C. Havana, they this important group arrived to Cayo Largo, conformed by 31 professionals of Argentina�s tourist industry, representing the tour operators Sol & Son, Solways, Julia Tours, Freeway, Eurovips and Havanatur, with the aim of accomplish an extensive program for the recognition of the Long Key tourist product. They were welcomed at International airport Vilo Acuña by directives of the Ministry of Tourism, the Gran Caribe Hotel Group, Cubanacán Travels Agency, among others and, they were given the representative necklaces of the tourist destination during a personalized Check in. The group will visit hotels and extra hotel facilities, they�ll go over La Marina and boulevard areas, they will carry out nautical tours and participate in cultural and recreational activities during all its stay. 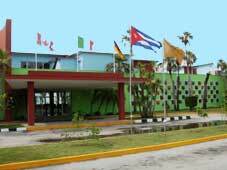 The news that are exposed in this page are elaborated and revised by the Commercial office of the Tourist Company of Cayo Largo belonging to the chain of Hotels, Gran Caribe, of the Ministry of Tourism of the Republic of Cuba, for what all emitted information is reliable.